Welcome to this weeks Hodgepodge post! Each week will be totally different and we hope that you enjoy these! On these days with me (Rachael), you'll be getting a first chapter review. I want to cut down on TBR pile and I thought the best way would be reading the first chapter of the book and deciding from there if I want to keep it or get rid of it. 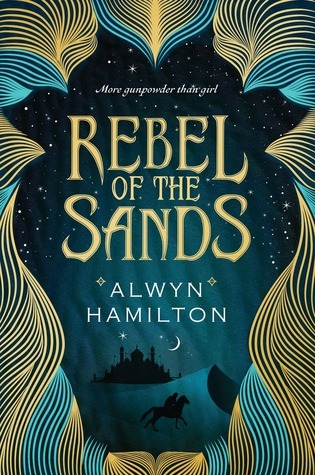 About the Author: Alwyn Hamilton was born in Toronto and spent her childhood bouncing between Europe and Canada until her parents settled in France. She grew up in a small town there, which might have compelled her to burst randomly into the opening song from Beauty and the Beast were it not for her total tone-deafness. She instead attempted to read and write her way to new places and developed a weakness for fantasy and cross-dressing heroines. She left France for Cambridge University to study history of art at King’s College, and then to London, where she became indentured to an auction house. She has a bad habit of acquiring more hardcovers than is smart for someone who moves quite so often. Noteworthy experiences while reading this book: I had to force myself to stop reading after the first chapter! Like I seriously wanted to just stop everything and finish the book. Recommend this book? Oh heck yes!! Notes and Opinions: Amani tough and feisty chick and I freaking love her! Go Into This One Knowing: Be prepared to not want to put it down!